Just a quick post to share some of my favorite tech tips. These are some that I think everyone is born knowing and then I’m shocked to find someone techier/younger/hipper who doesn’t know it. 1. Print 2 to a page. Pro tip: Type your original on legal. 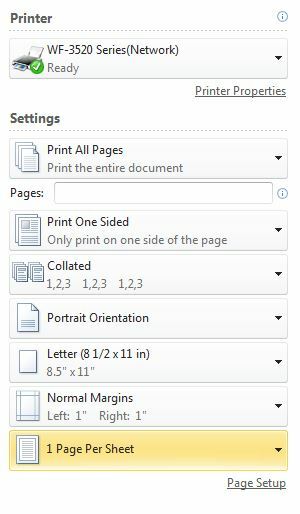 When you print 2 to a page, it will use up all that space you get at the bottom when printing letter 2/page. A) Combine with tip #1. Type your document as normal (because using Word’s 2 to a page layout while making a worksheet is super annoying), maybe using a slightly larger font (maybe 14, but I can get away with 11). Choose doPDF as your printer and choose 2 copies. 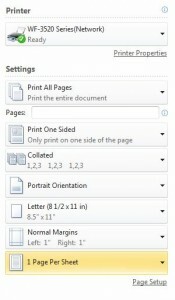 Then it opens up the PDF and you can print 2 to a page from there. This really helps when you use the protip above, because sometimes Word doesn’t play nicely printing legal 2 to a page. B) Make a PDF of a powerpoint handout to post for your students. Is there anything more annoying than seeing a kid in the library print out 27 full-page slides? But since you can’t teach everyone everything, this helps. C) Print all those annoying “print this confirmation” pages (even though I’m about to get 12 different emails confirming that I did, in fact, order Orphan Black Season 2 because I can’t wait for it to come on Amazon Instant Prime). 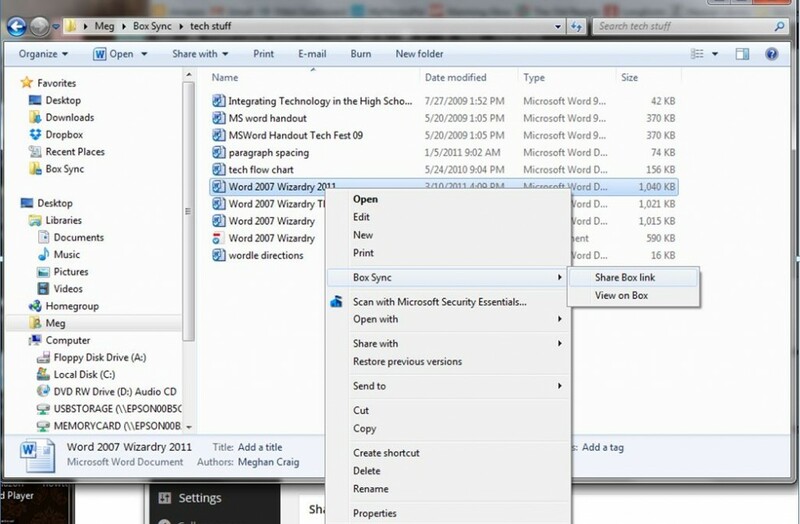 Send them all to a “receipt” file. Bonus if you can spell “receipt” right on the first try. Dude, I just learned this one last month and I’ve been a dropbox user forever. I would always go to the website to get a link to share, but did you know that with box or dropbox, you can right-click on the file or folder on your desktop to get the link? It’ll copy it straight to your clipboard. Am I seriously the last one to learn about this? For those of you that thought my Equation Editor “My Favorites” was just a bit too fast, here is a recap. I’ll also be talking about it and doing a quick demo on Global Math Department tonight as part of the TMC14 recap–please join us! It’ll be my first time non-lurking. Rule number 1: The equation button in the ribbon is VERY tempting, like a man with candy in the back of a van. DO NOT GET IN THE VAN. Good life rule, but in this case it is because: (1) formatting is crap (2) some things are intuitive, but many are not (3) you can’t copy and edit it in powerpoint (4) it does not play well with printers. If you’ve ever printed a worksheet and just the fraction bars are printed but no numbers, thank the equation button. Haha, I know it looks like there’s not a space between “and then” but it’s a weird table-formatting-issue, not an equation-editor issue. In normal text it looks like a space! Really, everything you need is in that handout, so go read it! Well, I say everything, but there are a few issues with Powerpoint. I’ll try to make a post about using Equation in Powerpoint soon. The good news is using Equation in Word is really quick and easy once you make some shortcuts and start working with it. If you have a question or have any Equation Editor tips I left out, let me know in the comments. And in case the handout is tl;dr, here are the videos (but really, read the handout! Don’t you want that chart?!? You want that chart. 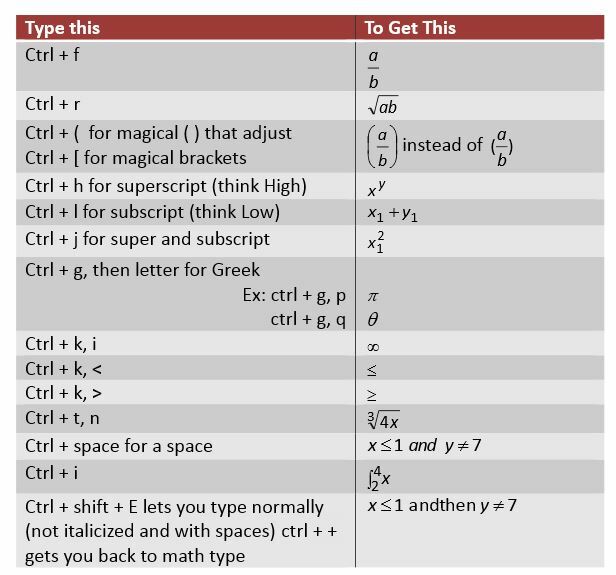 Seriously, you did not know ctrl + k, < gave you a ≤, did you? Plus if you read the handout, you can learn how to get ≤ without using underlining or equation editor! And if you made it all the way to the end, a gold star for you!